The Guardians of Alola are are set to be major players in the 2017 metagame. Each member of the quartet has their own signature ability that summons one of the four terrains. Most teams will want to use a Tapu. Not only are they some of the strongest Pokemon in the format they all reduce each others power by replacing their terrain effects. This also makes it harder to use multiple Tapu’s on a team, as they have anti-synergy with each other. The Tapu share the signature move Nature’s Madness, which is a Fairy type Super Fang. This move gives the guardians access to their signature Z-move, Guardian of Alola, which deals damage equal to 75% of the targets remaining HP. This move is mostly useless. Only Tapu Fini is likely to use Nature’s Madness, and only role-players are likely to use Guardian of Alola. Tapu Koko was one of the early Pokemon I really liked and was hyped about. When Tapu Koko’s base stats and learnable moves were revealed with the demo I was crushed. We got a speed stat that I never would’ve been greedy enough to ask for, but the special attack was a huge letdown. Despite the initial disappointment, Tapu Koko is still a great Pokemon. Having a free 1.5X boost to Electric attacks in Electric Terrain allows Tapu Koko to get a lot more millage out of its 95 base special attack. You also can’t understate the value of base 130 speed, which puts Tapu Koko ahead of every non-boosted Pokemon in the metagame. Tapu Lele has Psychic Surge, which summons the new Psychic Terrain. Not only does this boost the power of Psychic moves by 1.5x it also protects all grounded Pokemon from priority moves. Psychic Terrain also activates Psychic Seed, which boosts Special Defence. Tapu Lele can be a terror in Psychic Terrain, firing off high power Psychic attacks on the special side (which isn’t as easily weakened as physical attacks). Lele’s big weakness is that many prominent Pokemon can easily KO it. Celesteela sees Lele as a free Beast Boost, Kartana sees Lele as a reason to exist. Lele also becomes less potent whenever another Tapu switches in and replaces Psychic Terrain. Successful Tapu Lele teams will likely focus on weakening physical attackers so Lele can wreak havoc on the opponent. Tapu Bulu is like the physical equivalent of Tapu Lele. Wood Hammer deals tons of damage with Grassy Terrain. If you want to be more conservative you can use Horn Leech to keep Bulu around longer. If you want to go for overkill Choice Band Wood Hammer and Bloom Doom can OHKO most of the format. The 50% boost to Grass moves is the main draw of Grassy Terrain, but the passive healing is not to be underestimated. Bulu will be turning 2HKOs into 3HKO on both sides of the field. Leftovers and Assault Vest can make Bulu even more resilient. Grass Seed activates in Grassy Terrain, which boosts defence. Wood Hammer deals so much damage that Grassy Terrain probably won’t prevent it from taking the KOs it wants, but on a bulky team you may find your chip damage is being wasted. Grassy Terrain also reduces the damage of Earthquake by half, making Bulu an excellent partner for teams with multiple Ground weaknesses. Tapu Fini isn’t as exciting as the other guardians. Koko, Lele and Bulu all have a terrain that boosts one of their STAB moves. Misty Terrain reduces the power of Dragon moves on grounded targets. Fini is already immune to Dragon and Dragon moves aren’t even great. Blocking status effects is nice to have but it can work against you when using Scald. The main benefit to Misty Surge is that it replaces the other terrain effects. Fini can use self Swagger effectively thanks to Misty Terrain, though I wouldn’t recommend it. Tapu Fini seems like the kind of Pokemon that won’t see play until later in the year when the metagame has more time to develop. The Ultra Beasts all share the ability Beast Boost. This ability is like Moxie but it boosts the highest stat instead of attack. This looks at the actual stat, not base stat and not taking boosts/drops into account. In the event of a tie Beast Boost follows the order of Attack, Defence, Special Attack, Special Defence, Speed. Meet the Ferrothorn of 2017. Celesteela is a Steel/Flying type with the most well rounded stats of all the Ultra Beasts. The set I like the most uses Heavy Slam, Leech Seed, Substitute and Protect. This set is very difficult to take down as Celesteela can wall many Pokemon in the format.Celesteela weighs a massive 999kg, meaning Heavy Slam will have 120 BP against most Pokemon in the game. Heavy Slam destroys Tapu Lele and does decent damage against most Pokemon that don’t resist it. Scoring a KO will make Celesteela can very difficult to KO thanks to Beast Boost. Both of Celesteela’s weaknesses can be mitigated through teammates like Marowak with Lightning Rod and Pelliper with Drizzle. Celesteela can also focus more on offence. Flamethrower helps deal with other Celesteela can destroys checks like Kartana. Getting a Beast Boost in an attacking stat makes Celesteela an even greater threat. I haven’t used an offensive Celesteela yet, nor have I been impressed with it when I see it. Due to the new timer system this set may be preferred because games can play out in a timely manor, but I don’t think it is as good in an untimed environment like Battle Spot. Nihilego was the one battle in game that nearly wiped my party, so needless to say I respect it as a threat. Nihilego can hit a lot of Pokemon for super effective damage like the Tapu’s, Garchomp, Arcanine, Gyarados and Marowak. Nihilego has a choice between using Life Orb and Focus Sash. Life Orb is needed to get many of the OHKOs Nihilego wants while Focus Sash is needed to patch up Nihilego’s terrible defence stat. This dilemma is why I’m not a fan of Nihilego, while it can take KOs against fast teams it has a rough time when it loses the speed advantage or faces a Pokemon it can’t hit super effectively. Kartana is a glass cannon. Actually, Kartana is worse than a glass cannon. Kartana is a paper cannon. Kartana sports a massive base 181 attack stat. This seems insane but it is Kartana’s lacks high base power moves to abuse it with. Kartana’s poor special defence makes it easy to KO with special attacks, and the low HP prevents it from getting good millage out of its great defence stat. We end up with a Pokemon that is great against the Pokemon it hits super-effectively and not so great against everything else. Grass/Steel hits some notable Pokemon like Tapu Lele, but can also be walled by Fire and Steel types. Kartana will easily fall to nearly any special attack, even resisted ones. Focus Sash helps to alleviate this to an extent. Like Nihilego, I don’t see Kartana getting much better as the format develops. Glass cannons always seem to drop out of favour as time goes on. Xurkitree was extremely common in the first week after the games were released. Xurkitree has a special attack stat that would’ve made most mega evolutions jealous. Coupled with a solid speed stat and reasonable distributed defences it isn’t hard to see why Xurkitree was appealing at first glance. Xurkitree can even boost its special stat to obscene levels with Beast Boost and Tail Glow. Its just a shame that Marowak is one of the cornerstones of the metagame. I personally don’t have a high option of Xurkitree. The first problem Xurkitree faces is a shallow move-pool. Once you’ve picked your Electric moves you have Energy Ball / Grass Knot and Hidden Power to round out your coverage. Facing Marowak is pretty miserable for Xurkitree. You just can’t do anything to Marowak and have to use Discharge if you want to do anything to the partner. While it was on a huge percentage of teams in the early days of the showdown ladder, Xurkitree seems to have been phased out of teams now. Pheromosa has amazing speed and great attacking stats. Unfortunately it has a shallow move-pool and terrible typing. Bug/Fighting just isn’t good and so many Pokemon can wall it like Marowak, Gyarados and Celesteela. You can use Speed Swap to make something on your team really fast, and maybe there’s a strategy to be had there. As with the rest of UBs I’m willing to be bold and say that Pheromosa will have little to no success this year. Maybe I’ll be horribly wrong, but usually fast Pokemon are at their best in the beginning of the format. Another Ultra Beast cursed with the terrible Bug/Fighting type combination. Buzzwole has great physical stats, but it’s special defence stat is awful. Unlike Kartana, Buzzwole doesn’t have the speed stat to compensate. The one cool thing about Buzzwole is that your opponent is less likely to know what it does because no one uses it. Like Pheromosa I’m going to say this one doesn’t see much play. Cool design though. I honestly don’t understand why Guzzlord sees no play. I’m not saying I don’t understand why it isn’t good, but it has enough going for it on paper that some players should be trying it. Guzzlord is basically a Hydreigon that exchanged some power and speed for bulk. Perhaps Fairy is just too strong or maybe other Trick Room sweepers are just too good. Its might be that Fairy types are too good, thanks to the omnipresence of the Tapu guardians. Notable Moves: Flare Blitz, Shadow Bone, Bonemerang, Earthquake, Substitute, Swords Dance, Protect. Alolan Marowak is an absolute monster. Thick Club doubles Marowak’s attack stat. The change to Ghost/Fire is exactly what Marowak wanted. As a pure Ground type, Marowak was much easier to manage because it only had one STAB to work with. Ghost/Fire is largely unresisted and Marowak still has access to Ground moves to round out its coverage. Bonemerang is the usually the preferred Ground move because it picks up OHKOs and gets through Focus Sash, but Earthquake never misses and adds spread damage to Marowak’s move-set. Lightning Rod isn’t as abusable as it is on Pokemon like Raichu, but it does give Marowak another immunity and protects Marowak’s partners from single target Electric moves. The Electric types in the metagame lack good moves to hit Marowak with. Marowak is so disruptive that Electric types will run Discharge just to get around it. Unsurprisingly, when Landorus-T and Groudon are unavailable Garchomp becomes the goto Ground type. Garchomp gets to relive its 2012/2014 days and do Garchomp things. Unfortunately for Garchomp, the Tapu’s and Celesteela are very hostile towards it. Poison Jab has become a respectable attack for allowing Garchomp to OHKO Tapu Bulu. Grassy Terrain is a major annoyance for Garchomp and being able to punish Bulu helps mitigate this. Thanks to Z-moves Garchomp has access to a single target Ground move. Garchomp has never really had a “nuke” attack in that past and has always relied on steady damage to get the job done. Z-moves with an immunity are quite risky as they can completely whiff. Tectonic Rage isn’t affected by Grassy Terrain like Earthquake is, allowing Garchomp to take an unexpected KO. Like Garchomp, Gyarados is mostly unchanged this generation. It can be a set up sweeper with Dragon Dance or a support Pokemon aiming to get more millage out of Intimidate. There’s also room for things like Choice Band. Z-moves might be a great thing for Gyarados. In 2014 Mark liked to use Life Orb on support Gyarados because he wanted to be able to do damage once he’d paralyzed and Taunted everything he needed to. Hydro Vortex can be the move that fits this purpose. Gyarados is surprisingly strong in the metagame. Marowak’s popularity seems to be a boon to Gyarados’s viability. As a teammate Marowak will redirect Electric attacks from Gyarados and makes using Electric moves . Marowak also makes Gyarados a more appealing teammate because it can defeat Marowak handily. While Gyarados is a great Pokemon in its own right I have no doubt it wouldn’t have picked up the usage it has if Marowak wasn’t in the format. Notable Moves: Flare Blitz, Burn Up, Close Combat, Crunch, Extreme Speed, Wild Charge, Will-O-Wisp, Snarl, Morning Sun, Protect. Arcanine has too many moves. Arcanine can be anything from a physical sweeper to a bulky supporter. This format has a high demand for strong Fire attacks and Intimidate, both of which Arcanine provides. Arcanine can go physical using a Choice Band or Life Orb and focus on dealing massive damage with Flare Blitz. Special Arcanine can focus more on reducing the opponent’s damage output with Intimidate, Snarl and recovery while still having a strong attack with Burn Up. My dreams of resurrecting the original ScrubChu were dashed when we found out non-Alola forms were not available. Alolan Raichu can form a new ScrubChu with Tapu Koko. In Electric Terrain Raichu will be faster than anything else in the game. From here you can spam boosted Electric moves. This combo isn’t too hard to stop. Ground types ignore your strongest attacks, Marowak is a huge problem and Lele and Bulu can remove your beneficial Terrain. Raichu benefits from both Electric and Psychic Terrain. If the opponent relies on Tapu Lele to handle your Electric attacks they’ll need to deal with you boosted Psychic attacks. Raichu also has a its classic support moves from generation 6 (sans Endeavour). GameFreak tried to make Hail a respectable archetype this generation, giving us two new Snow Warning users and a Hail version of Swift Swim. While I highly doubt Hail teams will rise to power Ninetales is a great Pokemon in its own right. In terms of offence Ninetales can use perfectly accurate Blizzard and Moonblast. Blizzard is great, but Fairy doesn’t compliment Ice particularly well, with both being walled by Steel and Fire types. What makes Ninetales worth using is Aurora Veil. Aurora Veil halves all damage done to your team from physical and special attacks for 5 turns. I still can’t find confirmation on whether or not Aurora Veil works like Reflect and Light Screen in doubles. Araquanid is a Pokemon that is made by its Ability. Water Bubble is basically 3 abilities rolled into one. This ability doubles the power of Water moves, halves the damage done by Fire moves and even prevents Burn. This makes Araquanid fantastic against all the Fire types in the format. These three abilities This ability compensates for Araquanid’s lacklustre stats. You don’t need a high attack stat when your Water attacks are dealing double damage. Water Bubble makes Araquanid a fantastic counter to the Fire types in the format. If you don’t find Protect/Wide Guard necessary to your team, Assault Vest is a fantastic item that allows Araquanid to tank even the strongest Electric attacks (except Gigavolt Havoc). Like 2014, Tailwind and Icy Wind have scarce distribution. Unlike in 2014, we have a myriad of strong Trick Room setters and sweepers (2014 had some strong TR options, but they were largely unexplored until late in the format). When this Pokemon was first revealed it was obvious that it was meant to be a Trick Room setter. Oranguru has a new signature move Instruct, which forces the target to use that last move it used. This creates a fairly obvious strategy of just set up Trick Room and spam spread moves until you win. Oranguru even has Telepathy as an ability to make Earthquake, Discharge, Lava Plume and Surf are no-brainers. When using Instruct with single target moves the Pokemon will target the same slot it did when it used the move. Oranguru is easily the most offensive Trick Room setter in the format. Oranguru essentially uses its partners move as it own, making up for a lack of offence of its own. Oranguru isn’t a slouch in terms of defences, but there are a few bulkier TR setters. What I like the most about Oranguru is its base speed of 60. This puts Oranguru ahead of most Pokemon looking to abuse Trick Room while still being slower than most Pokemon. This is important for Instruct, as Oranguru needs to go after its partner in Trick Room. Alternatively, Oranguru can allow a fast Pokemon to attack sooner in Trick Room. I’ve been using Tapu Lele and Oranguru in the battle tree and Lele can KO a Pokemon slower than itself while Oranguru sets up Trick Room and then Oranguru can make Lele attack again immediately. In a Trick Room mirror Oranguru can forgo Trick Room and just use Instruct before the opponent’s slow Pokemon can attack. Porygon2 holds the distinction of being the bulkiest Trick Room setter available. Porygon2 doesn’t have anything as exciting as Instruct but it makes up for it with incredible bulk and Recover. Porygon2 can play the long grind game, healing up during Trick Room turns and surviving to set up Trick Room again. To get an idea of how bulky Porygon2 is, a Porygon2 can survive a Rain boosted Hydro Vortex (Base 185) from Golduck in the rain and then a Scald from Pelipper. Toxic is a legitimate consideration on Porygon2 for the mirror. Download is the only viable ability Porygon2 currently has available. In doubles, Download will look at the average of both opponent’s defence and special defence stats. Its worth knowing which Pokemon combinations on your team give what Download boosts. Once Analytic becomes available we’ll have a more reliable ability, albeit one with a lower potential boost. Mimikyu doesn’t have to be used as a Trick Room setter, but it is quite the unique Trick Room setter thanks to its ability Disguise. Disguise lets Mimikyu ignore the damage from the first damaging attack used against it. Secondary effects can still occur, but even a Z-move will fail to inflict damage as long as Disguise is intact. This makes Mimikyu really annoying to remove from the field. Mimikyu is also immune to Fake Out, cutting off another potential way to stop Trick Room from going off. When not going for Trick Room, Mimikyu is actually faster than a lot of the available Pokemon. Between this and Disguise Mimikyu has a lot of time to use its myriad of support moves. Never-Ending Nightmare, the Ghost type Z-move, is surprisingly powerful in spite of Mimikyu’s base 90 attack. Many Tapu Lele and Marowak may be punished in London if they don’t respect Mimikyu as a threat. Schooling gives Wishiwashi incredible base stats while above 25% HP. Wishiwashi has the bulk of a Rotom and attacking stats rivalling Chandelure and Landorus-T. Wishiwashi has a very low speed stat, but we can work with that thanks to Trick Room. Wishiwashi is an ideal Trick Room sweeper, especially with Oranguru. Once Trick Room is up you can spam Surf + Instruct. If you’re not using Oranguru you still have access to Muddy Water, but then you’re using an 85% accurate move willingly. Feels 2016 man. Single target Water moves can also get the job done, but don’t capitalize on Wishiwashi’s full potential. Endeavour ensures that Wishiwashi can continue to deal damage after losing its schooling form. There is a little known change to some old berries that helps Wishiwashi keep its Schooling form. This generation buffed Figy, Wiki, Mago, Aguav and Iapapa Berry. These berries now heal a Pokemon for 50% when their total HP goes below 25%, but confuse the Pokemon if it doesn’t like the flavour. These berries are great for Wishiwashi for keeping it in school form. A Z-crystal is also a solid option for Wishiwashi, turning Surf/Muddy Water into a single target attack. Without Amoonguss in the format Parasect is the next best alternative (I don’t think the new mushroom is any good). Like Amoonguss, Parasect has access to Spore and Rage Powder while being extremely effective in Trick Room due to its low speed. Parasect even has Wide Guard to set it apart from Amoonguss. Unfortunately, Grass/Bug is far worse than Grass/Poison defensively. Parasect works well with Rain teams and Wishiwashi, providing them with redirection and Wide Guard support while being healed by rain/Surf. Torkoal received Drought as an ability this generation, lifting it from obscurity to a Pokemon that will have an impact on the metagame. Torkoal fits the role of slow Trick Room sweeper perfectly, with an incredibly low base 20 speed stat. Sun boosted Eruption hits hard even against Pokemon that resist it. Torkoal will want another Fire move for when its HP gets low. Using a Z-Crystal with Eruption gives Torkoal access to a 200 BP Inferno Overdrive. Inferno Overdrive is great for when your HP drops or you’re facing Wide Guard. Charcoal boosts the damage of Torkoal’s Fire moves, which is also a strong consideration. Torkoal getting Drought caused another old Pokemon that got a chance to shine this generation. Lilligant supports Torkoal outside of Trick Room. Thanks to Chlorophyl, Lilligant will usually be the fastest Pokemon in the sun. Lilligant can use Sleep Powder to keep Torkoal safe and if 75% accuracy isn’t your thing Lilligant can also use After you to fire off Eruption immediately. Lilligant/Torkoal is honestly a really stupid combination, for the same reason Mega Charizard-Y/Venusaur was stupid. Sleep Powder can beat soft counters with good RNG. I don’t want to have to use something like Overcoat Kommo-o or Safety Goggles to handle this duo. Liked using Geomancy but didn’t enjoy primal reversion and Dark Void? GameFreak has you covered! There are some new Z-moves that provide the user with extreme stat boosts. What makes Porygon-Z notable is Z-Conversion. Conversion base effect changes the users type to the first move in their move set. Using Conversion as a Z-move has the added effect of boosting all of the users stats by 1. This strategy has a lot of variation. Assuming you’ll run Protect this leaves you with two attacks, one of which you’ll have Adaptability STAB with. There are nearly endless combinations of moves you could use. I’d recommend using either Shadow Ball as your first attack, with Ice Beam or Tri Attack as the second attack. Using Shadow Ball as you main attack lets boosted Porygon-Z take out Marowak and Tapu Lele with ease. Few Pokemon resist Ghost so this makes an ideal STAB move. Becoming a Ghost type also leaves you with few weaknesses you can’t cover with your own Shadow Ball. Ice Beam has good coverage and can OHKO some threats like Garchomp and Tapu Bulu. Using Tri Attack as your secondary move gives you perfect coverage and lets you deal big damage without using Z-Conversion. You can even use Breakneck Blitz if you need to. This versatility is what I like about Porygon-Z. You don’t need to build the entire team around it and it doesn’t need to set up in order to be effective. Notable Moves: Last Resort, Baton Pass, Protect, Return? I think most of us expected Extreme Evoboost to be a joke. This exclusive Z-Move gives Eevee +2 in all its stats. Last Resort is the attack needed to activate the Z-move, which fits the strategy of sweeping with Eevee afterwards. Trying to sweep with Eevee itself is actually pretty hard to pull off. While Last Resort is incredibly powerful, it can’t hurt Ghosts and some Pokemon are bulky enough to withstand it. Like Xerneas in the last format, Trick Room is a great answer to Eevee. The other way to use the boost is to use Baton Pass and give the boost to something else. Anything that was good becomes insane when you give it +2 to all its stats. This strategy requires even more set up, but the payout is pretty much a guaranteed win if you can pull it off. Psych Up can also produce similar results. I tried this strategy out after beating someone who was using it on Showdown. I lost 6 games in a row before finally winning one. As much as I’d like it be, I don’t expect this strategy is very good. As long as it remains in obscurity it has the potential to find success. When the mechanic was announced it was hard to imagine how good Z-moves were. In the formats from generation 6 we had mega evolution, a mechanic which was feature on every team (except scrubs and the one Enosh team in early 2014). Z-moves seemed much less like a necessity and more like a strong option. I’ve played about 250 games of 2017 and I think I’ve got a good grasp on the mechanic. I think Z-Moves are good enough that you want to use one on every team. 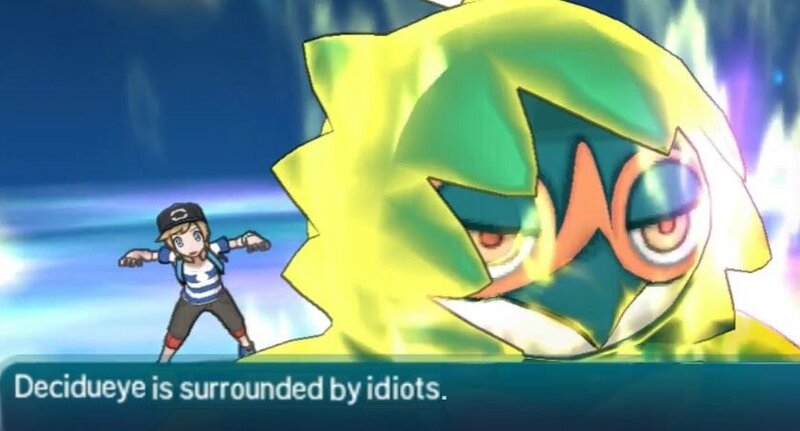 Thats not to say that you need to bring the Pokemon that has the Z-move to every game, nor do you need to fit more than one on a team so that you’re move likely to bring a Pokemon with a Z-move. When building a team I find it unlikely that you end up with 6 Pokemon that all need a specific item. A Z-crystal makes a great filler item on any Pokemon with a decent (special) attack stat. Z-moves provide a team was a high power attack to score crucial KOs with, but they do so much more than that. Pokemon like Garchomp and Krookodile now have access to a strong single target Ground move. Torkoal can maintain offensive pressure once its HP gets low. If a Z-move is blocked by Protect it can still put the target in range of the base move. Z-moves also bypass the accuracy check, making them an emergency out against Minimize. Pokemon Sun & Moon removed the battle timer for a personal timer that only counts down while you select your moves. This prevents a player form intentionally wasting time during move selection to run down the timer. While this “problem” is solved, we now have another problem that is infinitely worse. If two players can select their moves quickly their game can last for hours in real time as the bulk of the match time is spent on animations. This is a terrible system for tournaments. The original purpose of the match time limit was to ensure tournaments didn’t get held up by two players having a stall fest. In order to prevent each round from lasting hours, the 2017 ruleset has decided that the global timer will be handled by the tournament organizer (TO). After time is up players have three turns left and after that the TO will decide the winner based on the tiebreaker guidelines. If you don’t finish your match in time you can even go to sudden death. This is what the TCG has been doing for years and no one likes it. This change encourages out-of-game tactics to gain an advantage in battle. There is going to be big pressure for players to start each game in a timely manor. Before if you paused between games to take a drink of water it was fine but now you’re wasting actual game time on it. One of the great things about VGC coming from the TCG is that there was no worry about these things, you simply played the game. Unfortunately, we’re stuck with this system unless GameFreak decides to patch Sun/Moon to restore the old timer system. I think the 2017 format is going to be incredible, and I expect the future formats of generation 7 to be better than those in generation 6. Nothing seems as oppressive as Mega Kangaskhan was. I feel so free now that there isn’t a Pokemon that can Fake Out for 30%. Things like the Swagger/Confusion nerf, the Dark Void nerf and Psychic Terrain eliminate many negative aspects of previous formats. There have been complaints about the high CP bar and entry fees increasing the financial cost of playing the game. Wallet Warriors will have an easy time making worlds by simply going to enough events to fill out all their BFLs. I would argue that this isn’t as big a deal as many are making it out to be, but it would be wrong to assume everyone is in the same situation as me. The ease of making worlds on a tight budget is largely determined by proximity of events. For BC players, we have two Regionals within driving distance and 2 MSS in our Province. With consistent quality finishes at lower level events we’d only need to fly one International Championship to lock up the invite. My one concern is that it’ll be nearly impossible to earn travel awards if you aren’t going to the early events. Players that do well in London will have a huge leg up on the rest of us and if they earn another travel award to future ICs they’ll be able to snowball their advantage. While the tournament experience might have some hiccups this year, I still think the quality of the format can make up for it. So many Pokemon seem viable right now it doesn’t seem like it’ll even be possible to test every idea I have fully. I’ve been writing this article on and off for 2 weeks because the more I play the more I’ve been adding to it. So while I was optimistic for 2016 for the sake of optimism I sincerely believe 2017 will be a great format that will be fun and interactive for the whole family.